BetaTrac is set to change the guarding market forever with the release of its latest wearable technology that keeps guards safe, on track and ensures clients get the best bang for their guarding buck. In a recent interview with Hi-Tech Security Solutions, Betatrac CEO, Keith Lawrence, explained why BetaTrac’s wearables, ‘The Tools’, are not simply another vest with a camera, but the result of years of research combined with local know-how and foresight. The crucial aspect of BetaTrac’s new guarding solution is that it is not only a hardware solution. It combines hardware (eGuard, eGuard-K9 and eBodyGuard) and software called AIMSS (Analytical Intelligent Mobile Security Systems) with communications technologies, and controls it all from a central management console. Most importantly, it reduces the need for supervisors to constantly monitor the guards' movements and whereabouts. Starting with the guard, Betatrac offers the eBodyGuard interactive composite jacket equipped with GSM/GPRS/GPS, as well as a miniature camera. The jacket has been designed to comfortably hold all the technology while hiding the cables connecting everything to the battery and modem. The GPS component of the jackets monitor the guard’s location and movement every 30 seconds, allowing the control room to see exactly where he is. This data is automatically transmitted to the AIMSS management software (more about AIMSS below) and is overlaid onto a map. Moreover, alerts can be set up to warn supervisors and management, either by SMS or email, if the guard has not moved for a certain period or if he is off his route. The small camera in the jacket, which takes remarkably clear images for its size, can be set to send an image back to the control room via GPRS at set intervals to provide visual evidence of where the guard is and what he is doing. More importantly, there is a manual button on the jacket that allows the guard to record images or video when he feels it is necessary. Similarly, there is also a panic button hidden in the jacket that the guard can press without making it obvious he is calling for help. The benefit of satellite tracking is that the company needs no infrastructure in the field where the guard has to check in. Not only does this mean less costs in managing guards, but less that can be damaged or stolen by opportunists. With the 30-second check-in via satellite, the guard will never be lost and always on duty. In certain jackets (the RapidCam range), Betatrac has included a DVR to record audio/video to avoid high bandwidth charges associated with using GPRS. Using the still image updates (in eBodyGuard), Lawrence says the system only uses minimal bandwidth due to the proprietary BTS compression technologies built into the system. In normal use, the battery lasts about 40 hours, which means the jacket can easily complete two guard shifts of 12 hours each (24 hours in total). Supplied with two batteries, a swap out continues the operations on a 24/7/365 duty cycle. The voltage is constantly monitored and if it falls below a certain level, such as if someone disconnects the battery, the AIMSS software alerts management of a potential problem. The outer portion of the jacket containing all the technology can be easily removed, allowing for easy washing and swapping out at shift changes. Lawrence says even the cables have been specially designed to take on the toughest conditions and remain reliable, and any tampering with the jacket by the user will trigger immediately an alert to the control room, supervisors or management. From a management perspective, guards can be assigned a patrol, with specific points they need to cross at certain times. The GPS system will register the guard’s presence within a 15-metre radius of the point and can raise an alert if a point is skipped. The route he takes is also monitored meaning clients can measure everything their guards do, from the time they arrive, the routes they follow, when they are standing still and when they leave. For clients that don’t want to provide each guard with the full eBodyGuard, Betatrac also provides an armband, known as the eGuard, that performs exactly the same as eBodyGuard, except there is no camera. There are also a range of jackets available with different technologies installed, depending on what the client requires. There is even the option for covert cameras that can’t be seen. The solutions are being sold under the RapidCam brand. Lawrence explained that these solutions provide three key elements in improved guarding services. 1. The guard is given a better safety shield to assist in his protection in an emergency. 2. The client can manage their guarding service through the application of intelligence to the data collected. 3. With AIMSS, it becomes a powerful management tool that not only manages the guards, but uplifts the services rendered by the guarding company. Traditional supervisors, for example, can on alternative days be taken away from their duties of continually travelling around to check on guards, and use their expertise to assist in training their teams more effectively. BetaTrac’s management platform, AIMSS, or Analytical Intelligent Mobile Security Systems, provides asset and workforce management guarding solutions in real time through a Software-as-a-Service (SaaS) model. This allows management to not only track people and assets in real time, but also monitor voltage, speed, movement, temperature and location – which is overlaid on a map, zooming down to street names if needed. For guard patrols, the system geofences the patrol area, raising an alert if a guard wanders out of his assigned area or stops for too long. It also notifies on delayed patrol starts. Lawrence says the system has endless parameters for improving services rendered. Yet, while offering real-time control, AIMSS also allows intricate reports to be drawn up of each guard’s activities, plus an autonomous daily report. These reports show the routes and times guards took during a shift, making it easy to graphically see where they went at what times. Because the guard’s GPS unit reports in every 30 seconds, they can’t hide any shortcuts they took, or when they stopped to chat or went to the shops. The system not only provides a graphical overview, but assigns a value to the guard’s patrol based on predefined routes and activities. Clients can decide that a score of over 85% (for example) is acceptable, but below that means the guard did not do his job correctly and take it up with the guard and his employer. AIMSS allows the company to play back the patrol to see exactly what happened, which will also assist with training. Betatrac is also making its vehicle tracking solution available under the RapidTrac brand. This is a geo-visual mobile image surveillance solution that provides real-time information and pictures on vehicles or fleets to secure not only the vehicles, but also high-risk cargo. RapidTrac will not only assist in capturing images of crimes such as hijacking, but also assist in discouraging reckless driving, giving lifts to unauthorised or non-paying people, reducing insurance premiums and optimising routing. It also prevents shrinkage and loss of goods in transit. RapidTrac not only provides real-time images and GPS locations, but analyses the information it gathers and provides an intelligent management system to control fleets and valuable cargo. Each vehicle can be fitted with up to four miniature cameras covering the cab and the storage area as well as other sensors. These sensors can be used to provide the control centre with information such as when doors are opened, braking patterns, motion in the vehicle and others. It provides a complete report on when and where the vehicle went, what happened, along with images to back up the reports. It also allows management to geofence vehicles to ensure drivers stay within a specific area or on a specified route. If required, it can also use RFID to track what products are loaded and unloaded at specific locations. Additionally, still using GSM or GPRS connectivity companies can have pre-selected text via a text screen module interaction with their drivers at any time, allowing them to ‘chat’ to each other. The final tracking product from BetaTrac is SmartTrac. These are tracking devices that can be attached to high-value assets with batteries guaranteed to last for five or 10 years with no charge or maintenance. The system provides static tracking, in other words on assets that shouldn’t be moving and checks in once each day with a health check. It also includes an accelerometer that will alert the control centre if the object moves. Vehicle and asset tracking takes on a new meaning with BetaTrac’s technology, driven by the AIMSS platform. 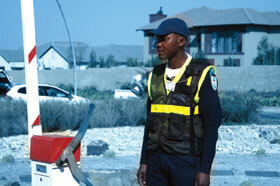 For the guarding industry, however, BetaTrac is set to change the guarding industry completely. Guards will be managed by data and guarding companies will need to ensure they meet the standards set by clients because the system will clearly report any failures in adherence to the SLAs. This intelligent and focused guard management platform will ensure that clients pay for what they receive instead of what their service provider claims they are receiving. The service providers themselves gain an enormous amount of analytical data to enhance and improve their services, a win-win for all.